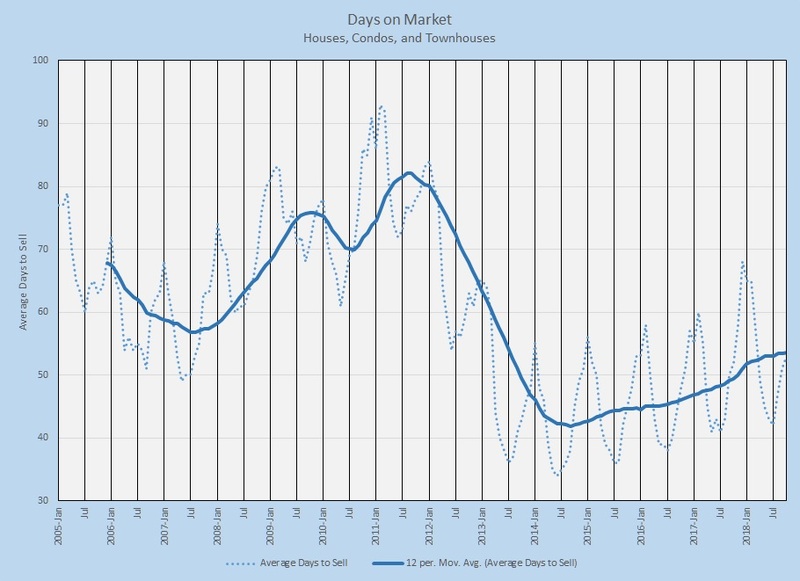 On September 26, I posted a complete look at my Market Dashboard and concluded that while the Austin-area market for residential real estate remains badly under-inventoried and fast-paced, we might be seeing some signs of movement in the direction of more normal conditions. Today I updated that dashboard with final data for September and my opinion is unchanged. Separately, I’ll provide the primary charts from my dashboard through 3rd Quarter. For now I’m just ruminating a bit on some subtle changes I saw in the latest data. Much of what I see in the new data isn’t visible in graphs, so I’ll just attempt to describe this change instead. The “odds of selling” for active listings in September was 31%, down from 38% in August. That’s still above the long-term average of 25% and slightly above the 30% 10-year average. What seems unusual is that we reached that level in September. We saw 30% “odds to sell” in November 2001, on the way down from the huge market peak in the Spring of 2000. We saw similar conditions in a few months during 2005, 2006, and 2007. 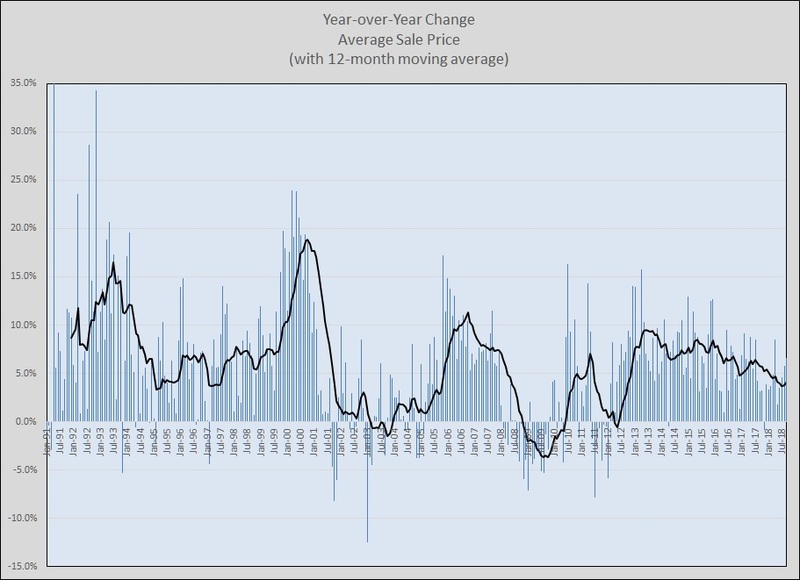 Then came the mortgage debacle, and the odds of an active listing selling stayed near or below 20% from September 2007 until early 2012, when we clearly entered our current very hot market cycle. Since then, the ONLY times we’ve seen annual dips at or near 30% “odds” were in January of 2013, 2014, 2015, 2016, 2017, and 2018. That’s 6 months out of 69 that we saw our odds of selling dip to near 30%, and always in January. So why in September this year? (For 40 of those 69 months, this metric was at 40% or higher, and it was at or above 50% in 7 months!) One anomaly doesn’t make a trend, but in conjunction with other changes discussed below it may be meaningful. There’s no doubt of the trend in annual price changes since 2013, but compare the slope of our current trend with the last three market cycles. Moreover, as I have noted before, the economic good news for the Austin metropolitan area remains positive, with unemployment dipping below 3% this month. This trend does not indicate a cliff ahead. So what does all this mean? Maybe nothing, but the odds of selling, time to sell, and upward price pressure are logically linked, and all three of these changes in our market point to a move toward normalization. This could just be the effect of a very contentious national election cycle, uncertainties about the future of interest rates, or simply the fact that the Austin area has so far been unable to provide enough housing to meet demand, leaving more buyers to search longer, but I’m watching these numbers in an effort to understand the future of our local market in the coming year or two.